Boston, Mass. : G.K. Hall, 1992. 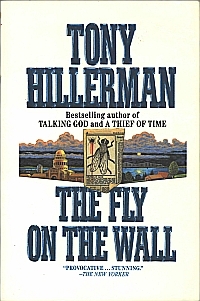 THE FLY | ON THE WALL | Tony HIllerman | G.K. HALL & CO. | Boston, Massachusetts | 1992. [i] title page, [ii] Also available in large print, [iii] Author's Note, [iv] Copyright, Imprint, 1-332 text. Binding: Heavy laminated paper, with a full color illustration printed on the front.